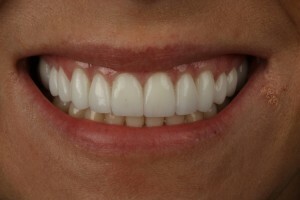 Have you ever wondered what <a href="https://www cialis canada vendre.sugarfixdental.com/chicago-porcelain-veneers/”>porcelain veneers look like? Well, Dr. Emery has some amazing results to show you! Veneers are beautiful restorations for anyone looking to enhance their smile. The first step in the process is having a consultation with Dr. Emery. She will sit with just you and listen to your wants and needs as well as discuss how you can achieve the smile of your dreams. (For the purpose of this informative blog, it would be “the smile of your dreams” with veneers.) Typically, we then will take several photos of you, including x-rays, and do an exam on your first day in order to make sure everything is sound for veneers. Pending there are no concerns, we move on to the next step. The second step is to take impressions for the lab. The lab will make models of your teeth as well as build the teeth up to their ideal size and shape. The perfected look then has a matrix made over it. The matrix is what transfers the beautiful smile to your mouth. Dr. Emery calls it her “road map to success.” The lab sends us this case back and we are ready to get started! While we wait for the matrix, we usually like to do a whitening treatment to get all of your teeth to their optimum white. Zoom whitening has great results for this and it usually takes about an hour to complete. The big day usually entails getting comfy with a cashmere blanket and movie while Dr. Emery works her magic! We will need a few to several hours of your time depending on how many teeth are to be completed. We then would take new impressions and chose what color you would like them to be. The temporaries or “trial smile” you go home with look great. They looked and felt so good that we have even had a bride get married in them! The final delivery day goes quite quickly; we take off your temporaries and use a Vaseline paste to try the veneers in. We look in several different lightings to make sure everything is what you imagined and more! We then cement your veneers in permanently! So exciting! We’ll also take impressions of your new smile to create a night guard to protect your investment. Do you still feel like you have additional questions about veneers? Please e-mail or call us, we would be happy to hear from you! In the meantime, why don’t you check out our veneers before and after page? You’re sure to SMILE when you look at all of our gorgeous restorations!